The two-year recession is forcing prospective beauty queens to cut back on costumes as they compete on the pageant circuit, a newspaper reported Monday. Contestants are cutting costs by wearing dresses more than once and selling outfits they planned to retire, The News & Observer of Raleigh reported. Brittany Crews said she has spent thousands of dollars on pageant clothes and accessories over the years. She shelled out about $600 for accessories that helped her win Saturday's Miss Johnston County pageant. "It's just like any sport," Crews said. "You need your equipment to play football or soccer." The costumes have paid off for Crews. She won a full scholarship to High Point University after winning the 2002 Miss North Carolina Teen USA title. She joined the Johnston County pageant hoping to earn money for graduate school. But Crews said she's been forced to thin out the costumes in her closet. She has rented evening gowns to high school girls attending proms. She's also selling some gowns, which fetch about half of the original price on the resale market. "In my mind, it's worth what you put into it," said Ashley Beasley, 23, who won last year's Miss Johnston County contest. She said she tries to be frugal about pageant spending, shelling out about $250 on a swimsuit and $50 on shoes and makeup to capture her victory. Borrowing, reusing and reselling are essential to avoid spending more than she earns, Beasley said. When she competes for the Miss Raleigh title next month, Beasley plans to wear the $2,000 designer velvet dress she wore in last year's Miss North Carolina pageant, where she was third runner-up. "I've got to be smart about it," said Beasley, who is from Gastonia but is working toward a master's degree in nutrition at Meredith College in Raleigh. Lauren Rhodes, 20, of the Cleveland community wore one of her old prom dresses during the evening gown contest on Saturday. Her mother, Donna Rhodes, said the $300 they had spent on this pageant was a reasonable amount. "Some people go way out, just overboard," she said, adding that her family had tightened its budget. 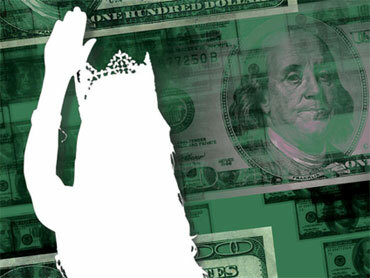 Penny-pinching doesn't always work in the pageant world. Carla Brooke Parker shelled out about $1,200 on outfits, shoes and accessories to wear on stage at the Miss Johnston County pageant. "My original plan was to reuse a lot of stuff," she said. "Then I was thinking about it, and I went shopping."